Phonophobia means "abnormal discomfort from sound". Another way of thinking about this is that almost everyone will develop discomfort from loud noises (i.e. this is normal discomfort from sound. Persons with phonophobia have a more rapid growth in their discomfort level, or perhaps a lower threshold for discomfort, than other people. This way of phrasing things implies two groups - -one that has a steeper slope of discomfort vs. intensity, and another that has an earlier "wall" which defines the point at which they signal that they are uncomfortable. Here we are explicitly excluding people who hear better than other people do -- this doesn't happen very often, but might occur in a condition called "SCD", where one can hear certain types of sounds better than normal people. Phonophobia is a common symptom with diverse causes. The closely related symptom of hyperacusis, has a prevalence of about 5% of the general population. It is also related to "misophonia", which has to do with discomfort from relatively soft sounds (think smacking of lips). Weather Barosensitivity ? Barophobia ? As is the case with smell and light sensitivity, with sound sensitivity there is an attempt to distinguish between having a lower sensory threshold, and having greater discomfort. Here, we are explictly not talking about lower thresholds. It is very clear that persons with migraine do not have better hearing than everyone else, but rather they can have greater discomfort than everyone else for loud noises. The technology of measurement of both thresholds and discomfort is very well worked out for sound, where assessment of "LDL" or loudness discomfort levels are routine when fitting hearing aids. This is a crude and subjective process of just asking patients when they think a sound is too loud. One would think that for LDL, one should "adjust" the discomfort level for the sensory threshold -- or in other words, attempt to differentiate between the input to the brain and the response to the brain. For hearing, this can be done by subtracting the pure tone threshold from the LDL. In patients with hearing loss, it is also possible for the mapping between percieved loudness and presented loudness to be steeper. The term "recruitment" refers to the perceptual phenomenon of sounds becoming rapidly louder with increasing sound level, leading to the somewhat paradoxical but common request of people with cochlear disorders “to speak louder” followed by the complaint to “stop shouting” (Cai et al, 2009). Another definition is abnormal growth in loudness with increases in stimulus intensity (Carver, 1972). Thus patients with recruitment have a lower sound threshold for discomfort, and have a type of phonophobia. In recruitment, the ear is damaged and there is hearing loss. So the same core symptom of phonophobia can be called "recruitment" when there is ear damage and reduced hearing thresholds. One method of testing for recruitment -- one ear is normal and other has more rapid loudness growth. From http://hearinghealthmatters.org/pathways/2016/loudness-recruitment-commentary/ (Frank Musiek, Ph.D). Classic loudness recruitment is best demonstrated by comparing the ear with sensory hearing loss to the ear in the same subject with no hearing loss. 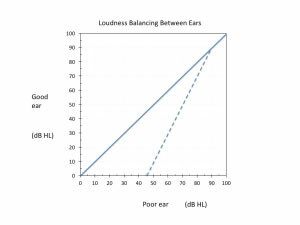 If one is to attempt to balance the loudness between the two ears by alternating stimulus presented to one ear and then the other, notable differences are observed at the lower levels but this difference disappears at higher levels. The SISI test is a clever method of detecting recruitment without comparing two ears -- it depends on the ability of a subject to discriminate between small changes in sound intensity -- patients with cochlear disorders can discriminate smaller steps in sound intensity, because the loudness grows more rapidly. Recruitment is presumably mediated by adaptive changes in the brainstem, and would not be expected to occur in patients with migraine. Loud noise is often reported by our patients to cause migraines. However, the headache literature seems to be rather unsympathetic to the general concept that noise is a migraine trigger. Schulte et al (2015) suggested that rather than sound being a trigger, sound sensitivity was part of a "premonitory phase" of migraine. Harriott (2014) reported that 70-90% of migraine patients report sensitivity to or aversion to noise durin an attack. Harriott (2014) also stated that about 2/3 of migraineurs report sensitivity to sound between migraine attacks. Martin et al (2006) suggest that migraine patients cause their own sensitivity by avoiding loud noises, and seemed to propose that migraine patients need to experience more loud noise. We are dubious. Somewhat similarly, Andersson et al (2005) suggests (without any proof) that psychotherapy might be a useful treatment for hyperacusis of any variety. Again, while we have nothing against psychotherapy, we are dubious that this is the answer for migraine sound sensivity. CBT (cognitive behavioral therapy), the subject of this article, was a fad for a while, that now seems to be waning. Rojahn and Gerhards (1986) suggested that migraine subjects showed a "higher level of general stress sensitivity", and implied that their greater noise "aversiveness" was in essence a personality characteristic. Ashkenazi et al (2009) reported "sound aversion thresholds", which appear to be "LDL" measurements under a different name. In 60 migraine patients, the mean SAT averaged at 1000, 4000 and 8000, was roughly 15 dB lower than 52 non-migraine patients. This was between attacks. During migraines, the SAT was also about 15 dB lower. We are surprised that the gap did not become larger during migraines attacks, as generally speaking light sensitivity and allodynia grow during a migraine headache. Vingen et al (1998) also reported more sensitivity to "sound-induced discomfort". Main et al (1997) similarly reported more discomfort to sound both outside of attacks as while having a migraine. Woodehouse and Drummond (1993) reported that both auditory and visual discomfort thresholds were reduced during attacks in migraines. They stated that the findings do not support the view that phonophobia is a manifestation of loudness recruitment. In a related measure, Joffily et al (2016) reported that women with migraine and phonophobia exhibited deficits in OAE suppression, suggesting a disorder of their ability to suppress outer hair cell responses. As OAE's are used to dampen sound, this study in essence says that migraine patients keep their outer hair cells turned on - -which would be a reasonable thing to do if one was troubled by loud noises. Intensity of sound perception in migraine subjects. There are no claims that migraine subjects can hear better than non-migraine subjects. In other words, migraine patients just feel as if their hearing is "supersonic". It may have more to do with attention than how well their ear is functioning. Andersson, G., et al. (2005). "[Hyperacusis--an unexplored field. Cognitive behavior therapy can relieve problems in auditory intolerance, a condition with many questions]." Lakartidningen 102(44): 3210-3212. Ashkenazi, A., et al. (2009). "Ictal and interictal phonophobia in migraine-a quantitative controlled study." Cephalalgia 29(10): 1042-1048. Joffily, L., et al. (2016). "Assessment of otoacoustic emission suppression in women with migraine and phonophobia." Neurol Sci 37(5): 703-709. Main, A., et al. (1997). "Photophobia and phonophobia in migraineurs between attacks." Headache 37(8): 492-495. Martin, P. R., et al. (2006). "Noise as a trigger for headaches: relationship between exposure and sensitivity." Headache 46(6): 962-972. Rojahn, J. and F. Gerhards (1986). "Subjective stress sensitivity and physiological responses to an aversive auditory stimulus in migraine and control subjects." J Behav Med 9(2): 203-212. Schulte, L. H., et al. (2015). "Photo-, osmo- and phonophobia in the premonitory phase of migraine: mistaking symptoms for triggers?" J Headache Pain 16: 14. Vingen, J. V., et al. (1998). "Phonophobia in migraine." Cephalalgia 18(5): 243-249. Woodhouse, A. and P. D. Drummond (1993). "Mechanisms of increased sensitivity to noise and light in migraine headache." Cephalalgia 13(6): 417-421.